A pupil/student is deemed officially enrolled and allowed to attend classes after he/she has complied with the complete documentary requirements for enrolment, including having made the initial payment of the prescribed fees. Pursuant to DepEd Order 03, s. 2018, transferees from public and private schools in the Philippines who failed to submit the SF 9 (formerly Form 138) upon enrolment shall only be temporarily enrolled until the submission of required documents on or before August 31st of the current school year. They shall be required to submit an Affidavit of Undertaking signed by the parent/guardian in order to be temporarily enrolled. For temporarily enrolled pupils/students, Notre Dame University will only issue Temporary Progress Report Card signed by the Class Adviser for the parent/guardian to monitor the progress of his/her child. This form is inadmissible for transfer and enrollment purposes and is only issued for progress monitoring. Upon complete submission of the documentary requirements, the pupil/student shall be tagged as officially enrolled in the Learner Information System (LIS). Otherwise, the pupil/student retains the status of temporarily enrolled; the pupil/student cannot be officially promoted to a higher grade level, and the pupil/student cannot officially graduate from the Notre Dame University. Notre Dame University may accept late enrollees provided that the pupil/student will be able to meet eighty percent (80%) of the prescribed number of school days for the entire school year and the quarterly requirement to pass the grade level. When the pupil/student enrolls in a school, it is understood that he/she is enrolling for the entire school year (Section 119-a, Rules for Registration, Revised Manual of Regulations for Private Schools in Basic Education). A pupil/student who transfers or otherwise withdraws within two weeks after the beginning of classes and who has already paid the pertinent school fees in full for any period longer than one month will be charged ten percent (10%) of the total amount within the first week and 20% if within the second week of classes regardless of whether or not he/she attended classes. A pupil/student is charged all the school fees in full if he/she withdraws within the third week of classes or after regardless of whether or not he/she actually attended classes. 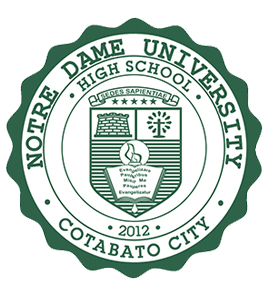 A pupil/student who discontinues his/her education after the third week of classes due to serious medical condition will be charged the full miscellaneous fees, all book charges whether the books were used or not, and the tuition fees from first month of enrollment up to the last month of his/her stay at Notre Dame University-Basic Education. The documentary requirement for this is the medical certificate. 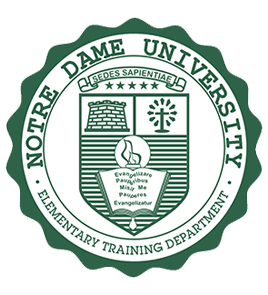 A pupil/student who is sanctioned with exclusion/advised to transfer or expulsion due to behavioral problems will be charged the full miscellaneous fees, all book charges whether the books were used or not, and the tuition fees from first month of enrollment up to the last month of his/her stay at Notre Dame University-Basic Education. Notre Dame University Basic Education Sector uses the standards and competency-based grading system pursuant to the Part V of DepEd Order No. 8, s. 2015. Furthermore, all the grades will be based on the weighted raw score of the learners' summative assessments. The minimum grade needed to pass a specific learning area is 60, which is transmuted to 75 in the report card. The lowest mark that can appear on the report card is 60 for Quarterly Grades and Final Grades. Pupils/Students from Grades 1 to 12 are graded on Written Work (WW), Performance Task (PT), and Quarterly Assessment (QA) every quarter. These three are given specific percentage weights that may vary according to the nature of the learning area. We envision ourselves as a center of academic excellence in graduate education, taking lead in research aimed at addressing current needs in the region, providing opportunities for students' involvement in strategic issues, empowering students such that they become catalysts of change, exposing them to current trends in their respective fields of endeavor enhanced and brought to higher level of expertise, establishing fruitful linkages with government and non-government organizations and offering alternative de-livery system of education. To play an important role in the socio-economic development of the region in particular, and of Mindanao in general, through its graduates whose knowledge and competency in their respective fields will be enhanced and brought to higher level of expertise. The GWA is the measure of the quality of the students' general academic performance during a semester leading to the promotion, graduation, honors and dismissal of students for a given academic year. The GWA is the sum total of the grade for the subject multiplied by its corresponding units divided by the total number of units. A Law student shall maintain the minimum GWA of 2.75 every semester. A Comprehensive Law Examination (CLE) shall be given to Law students who have completed all the required subjects for the first to third year of the College of Law curriculum. 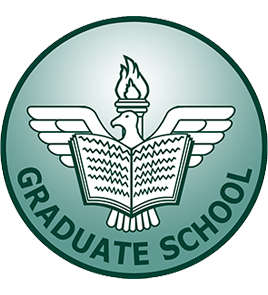 For admission to the fourth year curriculum, a Law student shall obtain a Qualifying Grade (QG) of at least 2.75 rating, computed as the average of the first year to third year GWA and the grade in the CLE. A Law student who fails to attain the required QG shall not be admitted to the fourth year curriculum, but shall take another CLE in the next administering of the same. If a Law student fails to obtain the QG twice, he shall be perpetually disqualified to enroll in the NDU College of Law. Fails to obtain a 2.75 GWA during probationary status in item (a) Law student shall be perpetually disqualified to enroll in the NDU College of Law. Fails in two bar subjects cumulative Law student shall be placed on probationary status. Fails in one or more bar subjects during probationary status in item ( c) Law student shall be perpetually disqualified to enroll in the NDU College of Law. 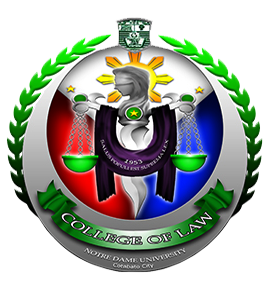 Failed in three bar subjects cumulative Law student shall be perpetually disqualified to enroll in the NDU College of Law. Drops bar subject/s during a semester Law student subsequently dropping the same subject/s shall be given a failing grade. provide the proper venue for the students to think critically and to acquire knowledge and skills needed in clarifying and integrating values so that they can lead a life that promotes cooperation and adherence to the strategies of non-violent conflict resolution. Instill the desirability of the participatory dialogical approach in the settlement of issues affecting the community, region, and nation. foster the appreciation of arts, and develop awareness and proper application of the sciences through varied activities open to the studentry and the community at large. encourage active participation and involvement among its faculty and studentry in achieving peace and development in the region especially, among the poor, deprived, oppressed, marginalized, and exploited through conscientization. undertake researches relevant to the development efforts of the region and disseminate findings for the use of concerned government and non-government organizations. develop and strengthen the students mathematical and scientific skills for relevant technology. proper understanding and application of mathematical theorems, scientific principles and laws in appropriate technology. instill among the students the proper attitudes and values for the appreciation and application of scientific and mathematical principles. to actively participate in community activities through relevant researches and extension. develop the arts of appreciation, interest, and understanding of nature, organization, complexity, and orderliness of environment in the world as a whole. develop a deep sense of awareness and appreciation of themselves, the society and the world around them and their Creator by reading literacy works that are not only artistic but also value laden. be proactive and responsible in promoting justice, truth, love and peace in themselves and in the community. develop critical thinking and the ability to argue soundly through the courses aimed at improving reading and argumentative skills. Increase their level of awareness on the realities of community life through pastoral involvement/community extension. enrich the general liberal education of students through understanding the diversity of human behavior and human society. help develop among students critical awareness on issues and events in society by exposing them to the multifaceted, social, economic and political problems around them. enable students to know and assert their rights, perform their duties as responsible citizens of the Philippines and of the world. provide opportunities for students to develop knowledge and skills in various aspects of social research. Students intending to take up Public Administration as a major should have at least a grade of 2.75 in Political Science 111. As a grade requirement for entry in Public Administration (in the sophomore year) applicants should have a grade of 2.75 and above in Public Administration 112. Transferees who wish to take Public Administration as a major course comply with the admission policy 1 and 2. 1. Students are required to take the prerequisite subjects first prior to taking advance major subjects. Students who advance subjects without taking the prerequisite are required to re-enroll such subject. 2. Public Administration students should maintain a grade of 2.75 and above in all major subjects. Any student who fails in 1 major subject and unable to maintain a grade of 2.75 in 2 major subjects will automatically be disqualified from pursuing their major. 3. Students with 2 failing grades in previous semester will automatically be disqualified from taking Public Administration as his/her major. A general weighted average (GWA) of 2.75 is a requirement for retention. A student who fails in Engl. 111 or Math 105 must receive a statues of "warning". The retention committee of the department shall evaluate his/her status. If a student obtains a failing mark again in any of these subjects, the student will no longer be admitted in the program. A failing mark in one (1) of his/her major subjects merits the student to be classified on probationary status shall only be allowed to carry maximum of 15 units in a semester. If a students improved his/her performance, he/she be allowed to carry the maximum of units allowable in a semester. A general weight average of 2.75 is a requirement for admission and retention. A student who fails in any one (1) of his/her major subjects in a semester requires him/her to attend a remedial class to be handled by the department. A failing mark in two (2) major subjects in a semester places the student on probationary status if he/she fails to improve his/her performance, which is, passing all his subjects in the subjects he/she enrolled. A failing mark in three (3) major subjects in a semester is a ground for non-admission in the program. The department subscribes to open admission for incoming freshmen and transferees. Students accepted to the program must pass all major subjects in a semester and must maintain an average of 2.50 or above in all enrolled major subjects in a given semester. A probationary status will be given to a student who is deloaded for 2 consecutive semesters. The student on probation will sign the Contract of Agreement with the Sociology/ Psychology/ Economics Department Program Head. A student shall be dismissed from the program for failure to comply with the Contract of Agreement for 2 consecutive terms. Have a grade of 2.50 or above in Main field in Sociology and have passed all requirements introductory subjects such as Socio 114 and Socio 224. Must not have a failing grade in any two Sociology major courses in a semester. One major subject load off shall be imposed to a student: who has a failing mark/ in or one dropped of the enrolled major subjects in a semester and shall be asked to sign Contract of Agreement. A student shall be dismissed from the program for failure to comply with the Contract of Agreement for two successive semesters. He/She shall obtain at least 80% in the entrance examination administered by the Guidance and Testing Center. He/She shall have a good scholastic standing. He/She shall obtain a grade of at least 2.50 in Philo 325 (screening course). He/She shall pass the interview conducted by the Philosophy board (chairperson and Philosophy instructors). He/She shall obtain a grade of at least 2.50 or above in all major subjects. A grade of 2.75 or 3.00 would require him/her to retake. Only in case of failure in one (1) major subject shall he/she allowed to retake. He/She shall regularly enroll the subjects prescribed in the prospectus. He/She shall have no failing grades in non-major subjects. He/She shall continually uphold the university policies/ rules and regulation. The department has been practicing open admission; however, the department observes the policy on retention for BA in Communication students. Admission into the BA in Communication program requires submitting a high school diploma from a recognized institution, passing the particular college/university's required admission examinations, as well as meeting all other requirements (e.g. and interview and/or written examination) the admitting department may impose. Students admitted into the BA in Communication program must maintain a grade weighted average of at least (2.5 or its equivalent) in all major and non-major subjects each semester. Students admitted into the BA in Communication program must comply with the HEI's rules governing retention. In the light of Notre Dame University's Vision/Mission Statement, the College of Engineering seeks to help the students develop their intellectual, emotional and spiritual faculties to become competent and productive professionals, imbued with social conscience and responsibility. are capable of passing the licensure examinations given by the Philippine Professional Regulation Commission (PRC) and other competency examinations. A student to be admitted to the Civil Engineering Program must have at least a grade of 85% in the Mathematical Ability Test (MAT) admission examination to be administered by the Guidance and Testing Center and a final high school grade of at least 85%. must have at least a grade of 85% in the Mathematical Ability Test (MAT) admission examination to be administered by the Guidance & Testing Center and a final; high school grade of at least 85%. Meet the criteria that are included under the retention policies of the CE program. The Dean/ Program head shall evaluate his/her credentials from the previous schools. A shifter from the other programs of the College of Engineering shall be admitted during his/her third year provided he/she has no failing grade in Chemistry, Physics and Mathematics. If he/she has failed in any of these subjects, he/she should have a grade of 2.75 or higher during his/her second take. A shifter from another college must have at least a grade of 85% in the Mathematical Ability Test (MAT) admission examination to be administered by the Guidance & Testing Center, a final high school grade of at least 85% and have no failing grade in Chemistry, Physics and Mathematics. A first year and second year Engineering student enrolled in both programs shall no longer be accepted for continued enrollment if he/she fails in any major subjects (Chemistry, Physics and Mathematics) and gets a grade lower than 2.75 for the second time he/she took the subject. A student who failed/unofficially dropped a subject/s shall be placed under probationary status. As probationary he/she shall not be allowed to carry regular load for the semester. The load of the probationary student shall be 3 units less than the regular load for every six (6) units with failing grade or dropped units. This provision is applicable to all year level. The transcript of record intended for PRC Board Examination shall not be released to the graduate until such time that he/she can present to the Office of the Registrar a certification from any duly recognized review center, certifying that the graduate is enrolled in the review proper. Transcript for Board Examination shall be valid only for one (1) year upon the date of issuance. For Competency Appraisal I & II subjects. An evaluation/quiz shall be given every end of each module and the passing score is fifty percent (50%)of the total number of points. At the end of the semester a Pre-board examination shall be given and the passing score is still fifty percent (50%). The student shall pass the subject if he/she at least obtained 50% of sum of all quizzes and the pre-board examination. Critical subjects for Board Examination (i.e., Theory I & II) shall not be offered during summer. Any student who is enrolled in On-the-Job-Training (OJT) during summer shall not be allowed to enroll in any of the academic subject during this period. A student to be admitted to the Bachelor of Science in Computer Engineering (BSCpE) Program must have at least a grade of 80% in the Mathematical Ability Test (MAT) admission examination to be administered by the Guidance & Testing Center and an average final high school grade of at least 80%. Must have at least a grade of 80% in the Mathematical Ability Test (MAT) admission examination to be administered by the Guidance & Testing Center. Must have met the criteria on the retention policy of the CpE program. The transferee's credentials from previous school/s shall be evaluated by the Dean and the Program Head. A shifter from the College of Engineering shall be admitted during his/her third year provided the shifter has not failed twice in Chemistry, Physics or any Mathematics subject. A shifter from another College must have at least a grade of 80% in the Mathematical Ability Test (MAT) admission examination to be administered by the Guidance & Testing Center, a final high school grade of at least 80% and must not have failed in Inorganic Chemistry, Physics or any Mathematics subject. A first year or second year BSCpE student who fails twice in Chemistry, Physics or Mathematics subject shall no longer be accepted for continued enrollment in BSCpE program. A student who fails or unofficially drops subjects having a total of 6 or more units during a term are automatically under probationary status. Students under probationary status shall not be allowed to carry regular load for the next semester. The load of the probationary shall be 3 units less than the regular load for every 6 units of failing grade (this includes dropped grades). This provision applies to all year levels. Students enrolled in the On-the-Job Training during summer shall not be allowed to enroll in any academic subject during the summer term. Companies where BSCpE students will undergo OJT shall be assessed to meet industry based standard. A student to be admitted to the Bachelor of Science in Electronics and Communications Engineering (BSECE) Program must have at least a grade of 85% in the Mathematical Ability Test (MAT) admission examination to be administered by the Guidance & Testing Center and an average high school grade of at least 85%. Must have at least a grade of 85% in the Mathematical Ability Test (MAT) admission examination to be administered by the Guidance & Testing Center. Must have met the criteria on the retention policy of the BSECE program. The transferee's credentials from previous school/s shall be evaluated by the Dean and Program Head. A shifter from the College of Engineering shall be admitted during his/her third year provided the shifter has no failing grade in Chemistry, Physics or any Mathematics subject. If the shifter has failed in any of these subjects, he or she should have a grade of 2.75 or higher during his second take. A shifter from another College must have at least a grade of 85% in the Mathematical Ability Test (MAT) admission examination to be administered by the Guidance & Testing Center, a final high school grade of at least 85% and have no failing grade in Inorganic Chemistry, Physics or any Mathematics subject. A first year or second year ECE student who fails in Chemistry, Physics or Mathematics subject and gets a grade lower than 2.75 in the second time he/she enrolled the subject shall no longer be accepted for continued enrollment in the ECE program. For Competency Appraisal I & II subjects, an evaluation quiz shall be given every end of each module. A pre-board examination shall be given at the end of the semester. The passing score for both quizzes and exams is 50 percent of the total number of given items. The final grade of the student shall be composed of 50 percent of the average of the quizzes and 50 percent of the pre-board examination. 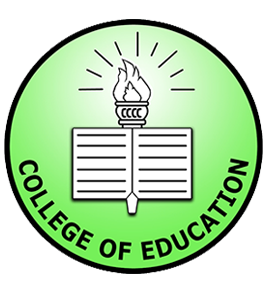 The transcript of record intended for ECE Board Examination shall not be released until such time that the graduate can present to the Office of the Registrar a certification from a duly recognized ECE review center, certifying that the graduate is enrolled and attending the review proper or has attended the ECE review within the last six months. The said transcript for board examination shall have a validity of one year upon issuance. Students enrolled in the On the Job Training during summer shall not be allowed to enroll in any academic subject during the summer term. A student to be admitted to the program must have at least an average rating of 83% in the admission examination to be administered by the Guidance and Testing Center and at least a general average of 83% in high school or 83% and above in Mathematics and English. Must meet the criteria that are included under the retention policies of the program, after his/her previous academic performance (based in his/her credentials), shall have been evaluated by the Dean of the college and the program head. Must pass the admission examination to be administered by the Guidance and Testing Center with the rating of 83% or higher. Failed twice in any major courses/subjects. Unofficially dropped the major courses/ subjects/s twice without valid reasons. Intentionally failed to remove the INC grade/s twice in major courses/subjects. A student who fails or unofficially drops subjects having a total of 6 units or more units during the term are automatically under the probationary status. Students under probationary status shall not be allowed to carry a regular load for the next semester. The load for the probationary status shall 3 units less than the regular load for every 6 units of failing grade (this includes dropped grades). This probation applies to all year levels. For competency appraisal I & II subjects, an evaluation quiz shall be conducted every end of each module. A pre-board examination shall be given at the end of the semester. The passing score for both quizzes and exams is 50% of the total given of items. The Final grade of the student shall be composed of 50 percent of the average of the quizzes and 50 percent of the pre-board examination. The transcript of records intended for EE board examination shall be released until such time can present to the office of the registrar a certification from a duly recognized EE review center, certifying that the graduate is enrolled and attending the EE review within the 6 months. The said transcript for board examination shall be valid only for one year upon issuance. Must meet the criteria that are included under the retention policies of the program after his/her previous academic performance (based in his/her credentials shall have been evaluated by the Dean of the college and the program head. Failed twice in major courses/subjects or passed the second time with a grade of 3.0. Unofficially dropped the major courses/subjects twice without valid reasons. Empower peoples and communities through community organizing-for a community-managed health care system. Promote a culture of wellness through health information, education and communication. Initiate health care to clients within the scope of the profession. Nurture and sustain interest for personal, socio-cultural, spiritual and professional development among faculty and students. Provide opportunity for student and faculty to take active role in community extension services. The adoption of policies on admission, promotion and retention of the College of Health Sciences students is imperative to ensure quality Health Science education and develop health care workers of competence, commitment and conscience. To maintain quality Health Science education, NDU-CHS shall adopt policies and standards in the admission, promotion and retention of students. Only those students who meet the admission and retention requirements shall be admitted and retained. Admission and retention of students in the College of Health Sciences is the responsibility of the Committee on Admission, Promotion and Retention (CAPR) consisting of the Level Coordinators, Clinical Coordinator, Program Head and Dean. The committee shall be chaired by the Level I Coordinator. Well-defined admission and retention policies shall be published and made known to students. Provisions of the Commission of Higher Education (CHED) as well as other pertinent laws, rules and regulations and the College Code of Discipline shall be considered as part of the admission, promotion and retention policies. 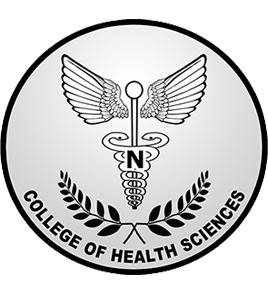 The College of Health Sciences shall regularly review its admission, promotion and retention policies. 1.1. Preferably not more than 25 years old. 1.2.	with pleasing personality, and preferably 5 feet tall and above. 1.3.	of good moral character. 1.5.	preferably with a rating of 80% and above in the qualifying examination administered by the NDU Guidance and Testing Center. 1.6.2 Submits a medical certificate attesting that the health problem will not interfere with health care practice nor pose a threat to others. 1.6.3 Submits updated reports to the level chair of his/her health status especially when treatment and regular medical check-up is prescribed by the physician. 2.1.5. Other requirements as may be determined by the college/university. 1)	That the spouse has given consent for the applicant to study and participate in all activities required of the Health Science students. 2)	That if she is currently pregnant, she can enroll only in nursing courses which do not require clinical exposure. However, if pregnancy occurs within the clinical exposure in the RLE course she is currently enrolled in, provided that the gestational age will not exceed 3 months by the end of the semester. 2.2.2a. A medical certificate stating the date of delivery. She can resume studies provided that a 60-day post-partum period has elapsed prior to the start of classes. 2.2.3 The above documents shall also be required of students enrolling to the succeeding levels who are in the same circumstances. The applicant must undergo the qualifying examinations administered by the University Guidance and Testing Center. The applicanthereon follows standard university enrollment procedures. The College of Health Sciences shall accept transferees to Level I second semester only. 1.2 have a rating of at least 2.75 (76 -79) in Theoretical Foundations in Nursing. 1.3 Re-enroll in Theoretical Foundation in Nursing if he/she has a rating of 3.00 (75%) from his/her previous school. 1.5.1.4. Antibody titer test: at least 6 months after the third dose .If the student has already completed the 3 doses prior to admission to the college, he /she will be required to undergo the antibody titer test.If the titer is inadequate, he/she will have to either receive a booster dose or repeat all three doses as the case may be. 1.5.1.5. Other diagnostic and laboratory tests that may be required by the health agency or institution such as drug test prior to exposure at Institute of Psychiatry and Behavioral Medicine Southern Philippines Medical Center (IPBM- SPMC) for Psychiatric Nursing exposure in summer for Level III. 2. Passed the pre-requisites subjects required for the succeeding level/course (see program of studies on Appendix A). 3.2. Theoretical Foundations of Nursing, Health Assessment, Community Health Nursing, Nutrition and Diet Therapy, Health Education, Pharmacology, Bioethics, Nursing Research, Competency Appraisal and Nursing Electives. 4. Incurred no failing grades under conditions cited in Section IV. A student is retained in the same level if he/she fails to take or pass pre-requisite and / or professional nursing subjects without the conditions cited in Section IV. 2.2.3	NCM / CHN RLE with two other subjects (professional or non-professional). 3. Is proven to have falsified any document (e.g. report card, computerized grade slips, certification , examination permits, IDs , official receipts , etc.) or committed a violation of any provision of the Code of Discipline which merits non-admission as recommended by the Board of Discipline. provide other opportunities to achieve the highest standard of teaching-learning environment. establish linkages and partnerships with professional organizations. Admission exam is administered by the Guidance and Testing Center. Student still wish to be admitted to the course they intended to be enrolled are place into a probationary period for a semester. Accountancy Department A Student Contract is entered into for reasons and purposes of monitoring, supervising, and enhancing Student's Performance in the course / program that he/she is enrolled, and involving parents in the program of study of their children. The Accountancy Faculty Council shall take care of assessing, evaluating and granting Student Status at the start of each semester. A status granted to a student will remain valid for one (1) semester. This Student Contract will be kept confidential by the Department Program Head. With grade below the cut-off of 2.00 in all Board Subjects, with failing and deficiencies (DRP/INC) grade/s in either general education, professional and board subjects taken, (basis Immediate Previous Grade Slip and Evaluation Form from the Registrar Office), grade's below cut-off grade of 2.00 in all Board Subjects must be repeated only once. With massive grade/s below the cut-off grade of 2.00 in all Board Subjects, with failing and deficiencies (DRP/INC) grade/s in either general education. Professional and board subjects taken., (basis Immediate Previous Grade Slip and Evaluation Form from the Registrar Office), grade/s below cut-off grade of 2.00 in all Board Subjects must be repeated only once. Having committed less grave offenses stated and defined in the University student's handbook. Has five (5) cumulative grade below the cut-off of the Board Subjects in the entire duration of the completion of the course. Integration Course Review Stage, who have committed the condition for automatic termination by the Accountancy Faculty Council, whose decisions are referred and endorsed to the College Dean, and with the College Dean's approval, are final, binding, and executor. Having massive cumulative failing grades/grade deficiencies. Skilled in utilizing computer and operating computer software. 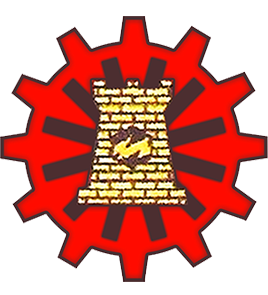 Competent in designing and implementing solutions for industry and business processes with the use of information technology. pass the competency examination given by a duly authorized certifying agency or institutions. proficient in designing and developing computing solutions. 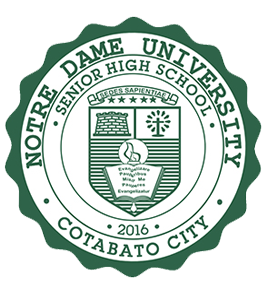 live and share the core values of Notre Dame University. are proficient in the installation, operation, application, and development of computer software. are skilled in hardware installation, operation and maintenance. 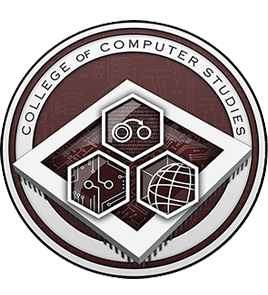 Student belongs to the College of Computer Studies may hold the status of regular or probationary. The load of the probationary student shall be 3 units less than the regular load for every 6 units of failing grades/dropped units. A student to be admitted to the Bachelor of Science in Computer Science (BSCS) must obtain a qualifying exam result (full scale) of at least 80 in the Multidimensional Aptitude Battery (MAB). A student to be admitted to the Bachelor of Science in Information System (BSIS) must obtain a qualifying exam result (full scale) of at least 78 in the MAB. A student to be admitted to the Bachelor of Science in Information Technology (BSIT) must obtain a qualifying exam result (full scale) of at least 75 in the MAB. A student who gets a rating below the college requirement may be admitted as probationary status to the college provided he/she obtain at least a general average of 80% for BSCS, 78% for BSIT, and 75% for BSIS in high school. 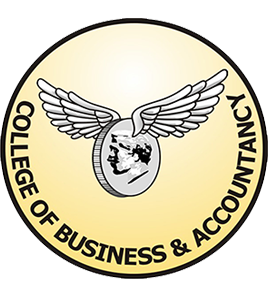 A student to be admitted to the Bachelor of Science in Computer Science (BSCS) must obtain a qualifying exam result (full scale) of at least 80 in the MAB. A student to be admitted to the Bachelor of Science in Information Technology (BSIT) must obtain a qualifying exam result (full scale) of at least 78 in the MAB. Bachelor of Science in Information System (BSIS) must obtain a qualifying exam result (full scale) of at least 75 in the MAB. The previous credentials of the transferee will be evaluated based on the retention policy of the college. Shiftee student who do not meet the cut off average of 2.75 will take the MAB exam conducted by the Guidance and Testing Center and pass the exam to be admitted to the College programs. A student with failing grades in two or more subjects in the last term (semester/summer) attended shall be placed under probationary status, as such he/she shall not be allowed to carry regular load during the probationary period. In case the student may carry only less than 15 units, the Dean has the discretion to increase the load of the student. The student failed in major/minor subject(s) twice will be placed to probationary status. For Students who are classified as 3rd year and 4th year shall be allowed continuous enrollment in the college provided that he/she passes the prerequisite subject(s) before taking the next subject(s) and with the inclusion of retention policy 2.1.
equipped with the essential competencies and apply effective teaching-learning skills in the practice of the profession through formation, instruction, research, and extension. highly motivated in enhancing their personal and professional growth towards local, national and global competitiveness. highly committed and value filled in molding learners to become authentic and versatile citizens of the country. equip students with human values and effective teaching competencies to become committed in molding learners to be authentic and versatile citizens in building peace and development. enhance the personal and professional growth of the students, staff, faculty and administrators towards growth of the students. sustain linkages with stakeholders in the community in promoting educational program for peace and development. No more failing grades, dropped subjects, or INC (Incomplete) marks during the probationary period. Regular consultation with the Dean and/or the Program Head. Must participate in all intervention and academic support programs and assistance given by the college. Students on Academic probation may become Regular student or placed in a particular probationary status in the semester immediately following basing on his/her final academic record. 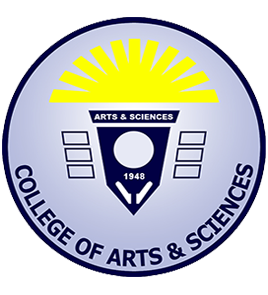 A student is considered dismissed from the College of Education or advised to shift to other Degree Program (degree program not offered in the college) if he/she incurred failing marks in at least four (4) or fifty percent (50%) of the subjects he/she was enrolled in, in the latest semester.